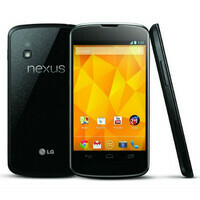 The launch of the Google Nexus 4 was a bit of a mess, wasn't it? Google's servers were acting up big time, which is why many of the folks who wanted to buy the smartphone had to walk away empty-handed after spending a few hours mashing that F5 button. But now that a new batch of Google Nexus 4 smartphones is on its way to the Play store, those very same people are likely ready to give it another shot. They might even be thinking of buying several units – one for themselves and a few more for friends and family members, so that they don't need to place separate orders. 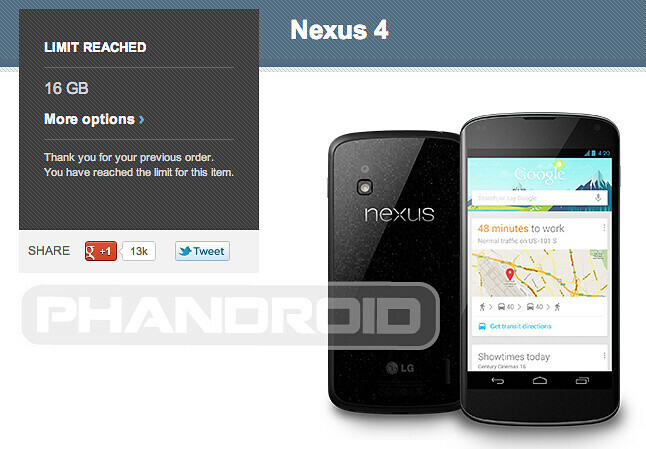 However, the folks at Phandroid did an experiment – they wanted to find out how many Google Nexus 4 units one could buy. And it turns out that the limit stands at two per customer, meaning that those who miraculously managed to purchase two Nexus 4 smartphones at launch will not be allowed to have another one this week. Those who bought one already from the Google Play store can still buy one more, however. Furthermore, customers who bought two 16GB models already can get two more with 8GB of storage, and vice versa. Although some may be frustrated by that, imposing a limit makes sense. First and foremost, the Nexus 4 demand greatly exceeds the supply, which explains why the first batch was sold out in no time. The limit increases the chances of more individual customers getting their hands on one. Besides, it is a way of Google preventing scalpers from buying the Nexus 4 by the boatloads only to sell it on the internet a day later at a heftier price. The smartphone is already cheap enough in the U.S., retailing for as little as $300 for the 8GB version, or $350 for the 16GB model. Even if it gets re-sold at $100 or so more, a Nexus 4 still offers a lot for its money. So, is anyone going to give it another go and try buying a Google Nexus 4 from the Play store as soon as stock is replenished? Let us know down in the comments! Limit was always 2 for every Nexus, no? At launch you could buy five. Not sure if that was five per storage config...probably. this is a great idea,buy 2 and have the other for x-mas present..
yes I am in. Only one will do for me. 16 GB. Hope I get lucky this round.